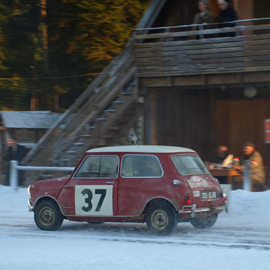 The chances are you’ll have seen MINI’s latest advert featuring the story of Paddy Hopkirk’s 1964 Monte Carlo Rally victory against all the odds, but if you haven’t, get yourself on to YouTube and type ‘The Faith of a Few’ into the search bar before you read on. This brilliant film has wowed viewers with its brilliant footage of 33 EJB working its way up the leaderboard,leading to the inevitable conclusion it must have been painstakingly spliced together from archive material. Well, painstaking it was, but archive material it most certainly is not. Paddy’s original 1964 Monte steed still exists of course, but it’s not suitable for being thrashed up the Col de Turini these days. However, the charismatic Ulsterman happens to own his own very convincing replica, which is left in the capable hands of the Padiham-based specialist. 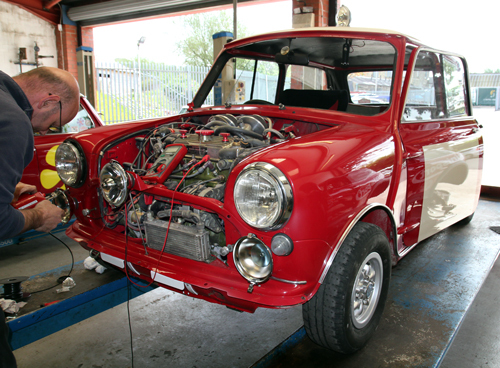 Not only that, but it also looks after his Appendix K rally Mini, 6 EMO. So when MINI brand ambassador Paddy had a conversation with the folk at BMW’s base in Munich, he naturally put Mini Sport’s name forward. 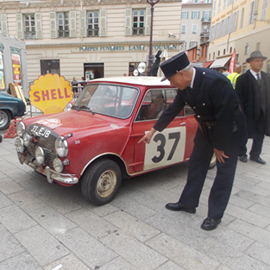 The responsibility for Paddy’s driving role was given to experienced Mini and MINI pilot Daniel Harper. “He isn’t a professional precision driver, but he is one of the best Mini drivers of the modern era,” says Chris. “Originally we lined up Steve Entwistle as I didn’t think Daniel could spare the time, but he wanted to do it as it was the only chance he would ever get to do something like this. As a true rally petrolhead, that was the right thing. 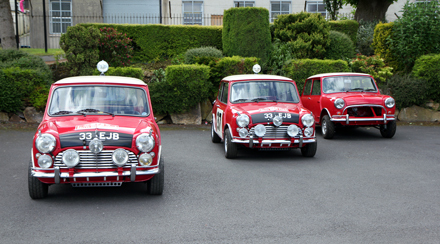 Mini Sport would eventually end up taking three cars – the 33 EJB replica, 6 EMO and Brian Harper’s Cooper S project for the garage scenes. However, it wasn’t as simple as that. 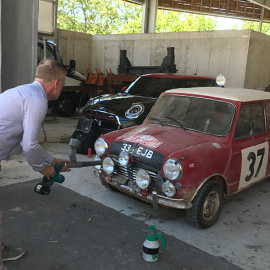 It only had about six weeks to prepare the cars after getting the green light, which included MINI picking them up about four or five days before the event. That left a lot to do. “33 EJB is a replica, and is pretty close to the original,” explains Chris. “There was no rollcage or anything else, and it’s fairly standard when you look at the spec. So what we opted to do was convert 6 EMO, which is an Appendix K rally car built for the job, remove the cage and make it look like 33 EJB. As it was built to go rallying, it was decided that 6 EMO would do most of the mountain work. The first day of filming wasn’t as intense as the days that followed, allowing people to get used to everything. 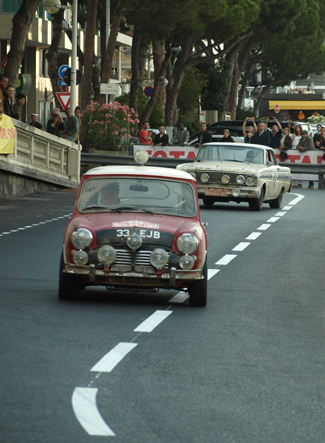 The scenes shot included the part where the Mini trails behind the Mercedes, Ford Falcon and Saab on the bridge, and the start in Reims where the young lady in period clothing describes the Mini as a “sweet little tin can, or a “toy” depending on which version you see! These were actually filmed in Nice, and involved the cast and extras wearing period winter dress in the searing summer heat. 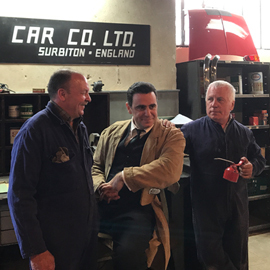 Day two saw the garage scenes being filmed, where John Cooper is told that his idea to create a performance Mini “will never work.” Look carefully and you’ll see Dave Thomas and John Cressey among the team of mechanics. Brian Harper’s Cooper S is in the background, as is a Surf Blue Mini Super owned by French-based Swedish enthusiast Jan Pettersson (who drove the car to this year’s Irish IMM!). 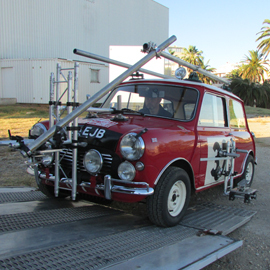 Many of the parts in the background were supplied by Mini Sport, but set dressing such as the signs were specially made, and the ramps were constructed from wood. This was also the day the original ACM timecard came out. “We don’t know if it was the original or a copy, it was that good,” Chris comments. The scene doesn’t depict the Abingdon garages, but rather the initial development of the Mini Cooper some three years earlier. 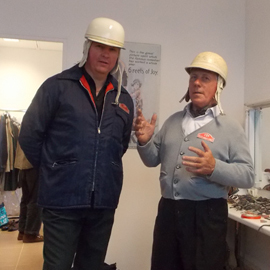 “Cooper did not produce the rally cars of course, Cooper is the man that put a bigger engine in it, then Abingdon got hold of it,” says Chris. “So it’s actually fairly true to life. Mike Cooper was actually very adamant that it should not be filmed as if Cooper had done the Monte Carlo. Instead it followed John Cooper’s thoughts from 1961. 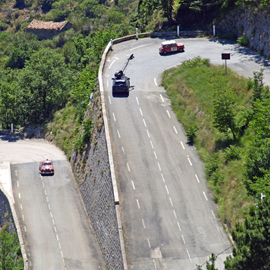 The day’s scenes would be shot on the Col de Braus. “We were up there for six hours,” says Chris. “The amount of filming that went on there was incredible, even though only a small bit of it made the cut. 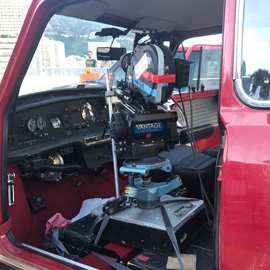 The Russian Arm had gone back to Monaco for some filming with the new cars, so 33 EJB was used to follow Daniel down the mountain with all the cameras on the front – one Mini chasing the other. Going up and down the mountain passes flat out was hard work for the cars, but they worked well. If a car was going to pack up it would’ve been then. One of the cars had that much heavy camera gear on it that it ended up boiling the brakes, but we sorted that. That’s when we suddenly got the call to do the hairpin scene with the Saab, which was shot in only 45 minutes. On the second take, Daniel nearly T-boned it because the driver, Espen, turned in too fast! He only just missed him. Because we were so much further up the mountain and it was still just as hot, the temperature was a problem for both cars. The Saab was knackered by the time we were finished. The advert first broke cover on September 12, and as you might expect, it’s been brilliantly received by Mini fans. Critics will have their say, of course. Some may mention the appearance of the new F56 MINI at the end, or that the advert is not 100 per cent historically accurate. 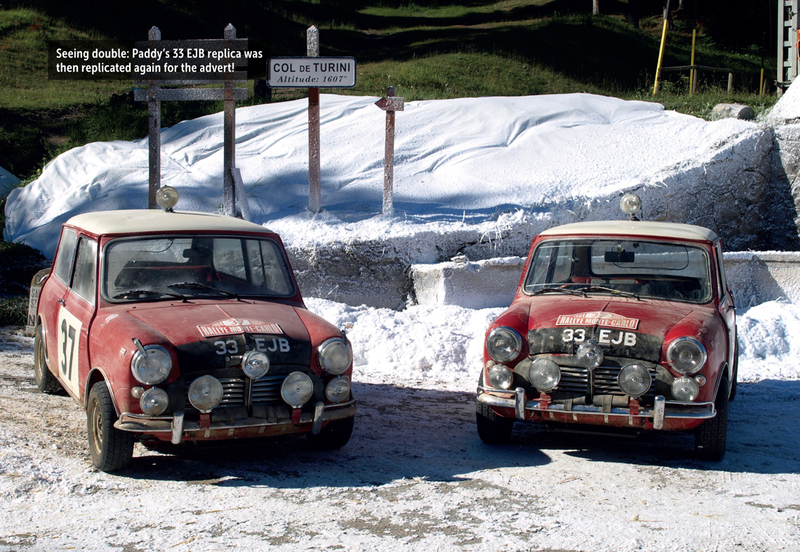 Granted, the Mini wasn’t quite the curiosity suggested as 38 were actually entered in 1964, and Paddy didn’t overtake his rivals in the same literal way as depicted. But then how would you show that in a film?